How To Recover Lost Call History From iPhone Update To iOS 10.2? Do you have any idea that how to recover lost call history after your iPhone update to iOS 10.2? This guide will show you how to retrieve lost iPhone call logs on iOS 10.2 by using iFonebox. If you have iTunes or iCloud backup, you are allowed to recover iPhone deleted call history after update to iOS 10.2 from iTunes and iCloud. Keep reading. 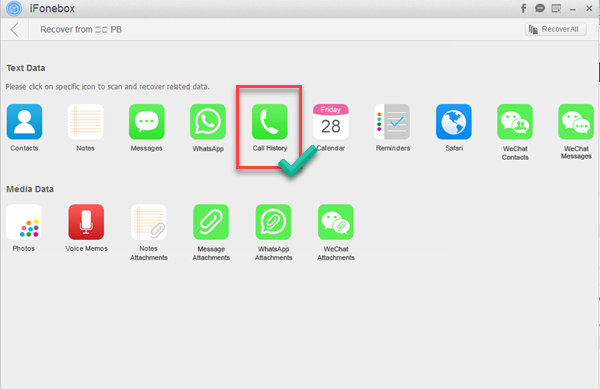 Similar: How To Recover Deleted Call Logs On iPhone 7? What is iFonebox? iFonebox is a safe, secure and user-friendly iOS data recovery software, allows you to recover as much as 16 types of data from iOS device. In addition, iFonebox supports extract and retrieve data from iTunes and iCloud backup files selectively. iFonebox also able to recover lost data when iPhone screen broken, stuck on Apple logo, iOS update failure, factory reset etc. Now you only need to click the download button can have such safe and secure data recovery tool. How to recover iPhone deleted call history after update to iOS 10.2? Here we take Windows as an example. If you are using Mac, you can just follow the same procedure. Launch iFonebox. 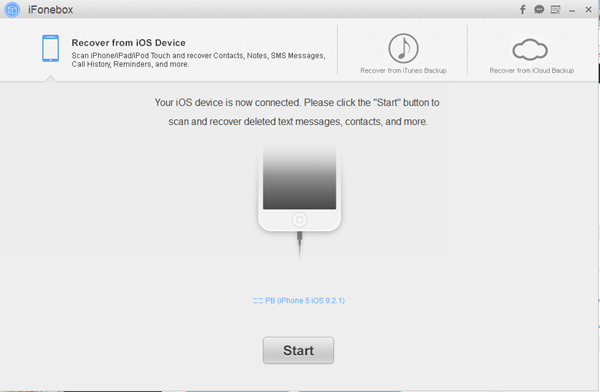 Select “Recover from iOS device”, connect your phone via USB cable, bear in mind that, you need to tap “Trust the computer” on your iPhone screen if it is the first time to connect your iPhone to PC. Next step is to click “Start” to begin. Scan “Call History” from iPhone. When you on the interface of iFonebox, you need to select “Call History” under “Text Data” and begin the scanning process. PS: if you having large data on your iPhone, it might take a little longer on scanning, just be patient. Preview and Select. After scan done, you can select “Only display the deleted items” to filter your results if you are looking for deleted call history. After done select, just click “Recover to PC”. 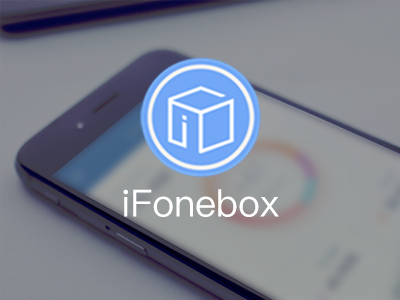 iFonebox will export the call log in both CSV and HTML format. Is it simple to retrieve lost iphone call log on iOS 10.2 via iFonebox? 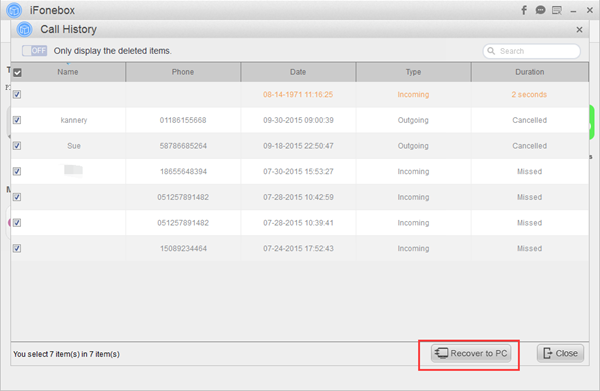 If you have an iTunes or iCloud backup, you may select “Recover from iTunes Backup File” or “Recover from iCloud Backup file” mode in order to find and recover your deleted call logs with the help of iFonebox. Read also: Is There Any Way To Pull Up Old Deleted Call Logs From iPhone? 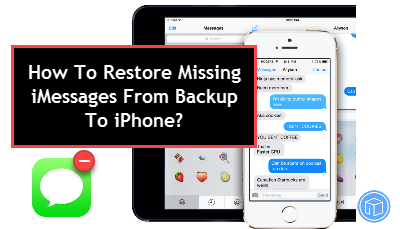 How To Restore Erased SMS History To iPhone 7 Plus? iOS 10.2 Deleted All Texts And iMessages, How To Find?